Created right here in Michigan, the Chevy Corvette was intended to be a concept car at the New York Auto Show in 1953. As soon as it debuted, the public fell in love and by the end of 1953 GM was producing the Corvette for public sale. The Corvette has been through seven generations, each with their own distinctive look. It was the second generation when GM created a lightweight version of the C2 and named it the Grand Sport Corvette. Only five first-run Grand Sports were built, though after being driven by such famous drivers as Roger Penske, Jim Hall, and AJ Foyt the car secured a place in the American imagination. In fact, those five Grand Sports are some of the most valuable Corvettes ever built. It seems fitting that the new Corvette Grand Sport pays tribute to that treasure of racing history, seeing as it may well be the best Corvette to date. Everything that defines a Corvette- style, speed, maneuverability- shines bright in this updated model. The car even looks fast while parked. Don’t worry- the 2017 Grand Sport lives up to the hype. Every single exterior element has a dual (and sometimes triple) role: strengthening grip, directing the airflow, improving handling. The distinctive mesh grille and hood vents work to increase downforce while cooling the engine. Add in magnetic ride control and specific stabilizer bars and you have an incredibly controlled and powerful driving experience. There isn’t an inch of wasted effort here, yet it doesn’t appear overdesigned. In an exciting update, the Z07 Performance Package is available for the Grand Sport. It’s the first time this package has been offered for this version. The package adds ceramic brakes, Michelin Sort Cup 2 tires, and a carbon fiber aero package. Drivers can choose from a seven-speed manual transmission and an eight-speed paddle-shift automatic. Underneath the hood is the same LT1 6.2 liter V-8 engine used in the Stingray, but a dual-mode exhaust gives it a kick to reach 460 horsepower. With the Z07 package, the Grand Sport can tear through a quarter-mile section of track in 11.8 seconds. This car can get from 0 – 60 in 3.6 seconds. This racetrack thoroughbred can generate 1.20g of lateral grip in a skid. Those kinds of forces would make cornering tricky- except the Grand Sport is equipped with a dry-sump lubrication to keep things running smoothly however the car moves. A car this fast needs a powerful, reliable brake system, and Brembo definitely fits the bill. The rotors- 14” squeezed by six-piston calipers in the front and 13.4” with four-piston calipers in the rear- are even tougher than the performance package on the Stingray. An electronically controlled rear differential comes standard. 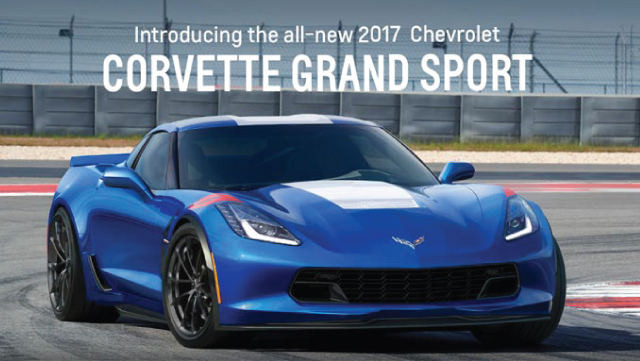 Pricing for the 2017 Grand Sport was just revealed earlier this month. Expect to pay $66,445 for a coupe model and $70,445 for the convertible. Those are base prices, though they do include the destination charge. Add a few thousand to that price for the Z07 package (trust us, you want it). The 2017 Corvette Grand Sport isn’t available until this summer, but we have plenty of Corvettes on the Heidebreicht lot. Drop by today and see our collection of Corvettes that got here just in time for summer! This entry was posted in Chevrolet Corvette, Uncategorized. Bookmark the permalink.